I am going to try and get back to my Blog. My friend Shawna has moved away and is looking for me to make some posts. So this is for you Shawna. Let us see if I can make at least two postings a week till the end of the year or longer. Here is a Perigee Falcon in my Garden. Brad worked with the birds for a few summers so he know a lot about them. This is a young male born this year and not banded. 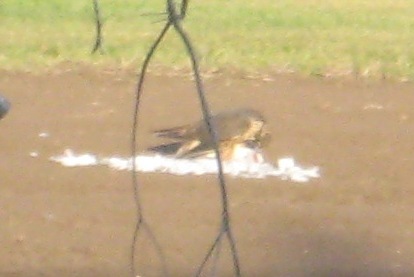 He took this gull down and ate it in our garden till a Red Tailed Hank came to bug him. He left most of the feathers here. He stayed in the garden for about 15 mintues and we got a good look at him. The boys enjoyed it.